Christmas has always been a special and sentimental time in my family. However, there were two particular Christmases that were literally thirty-five years apart—to the hour—that took my breath away. Both involved God, and both illustrated to me that national (and planetary!) boundaries were insignificant to Him. The first of these Christmases was in the late ’60s, when the iconic “Earthrise” photo was taken on the first manned flight to the moon. On Christmas Eve, 1968, in Illinois (which would have been Christmas morning in China), my parents, my sister, Amy, and I were gathered in front of the TV, along with hundreds of millions of people around the globe as astronaut Frank Borman said, “And from the crew of Apollo 8, we close with good night, good luck, a Merry Christmas—and God bless all of you, all of you on the good Earth.” “Earthrise” mesmerized people, because its beauty could only be the creation of God. He made it just for us. Although my second unforgettable Christmas was not exactly “out of this world,” it was on the other side of the world—at Northeast Normal University, in Changchun, Peoples’ Republic of China, and like the astronauts, I was oblivious to national boundaries at the time. My trip to China had already proven itself to be less than routine. I’d accepted the job of teaching “Conversational English” at NENU several months earlier, while a life-long battle with epilepsy raged on. Epilepsy had challenged me since I was eighteen months old, when my head was injured after falling down a flight of stairs. Since it’s always been a major issue that has been misunderstood in America, I expected that the Chinese would be even less understanding. However, I never expected how remarkably mistaken even the most educated people I encountered there could be; some of them couldn’t even be convinced that it wasn’t an infectious disease. Rather than sitting in a circle on the floor, opening Christmas presents with my family, I was dumbfounded when my post-graduate students set their desks in a circle to start a discussion about the significance of the holiday. I knew I had to tread carefully, for the safety of my students even more than for my own, because I had been warned not to promote religion (and capitalism), and I had even signed a contract to that effect. If any of those students were caught having such a discussion, they could be expelled from school, fired from their jobs, and possibly even imprisoned. It had been a puzzling and paradoxical holiday. Throughout the second half of November and all of December, I was puzzled to see store windows full of cardboard signs saying “Merry Christmas” and pictures of Santa Claus and snowflakes. The decorations themselves were low-quality cardboard, affixed sloppily with Scotch tape, but there were plenty of them in most store windows. I certainly didn’t expect Christmas decorations of any kind in Changchun, nor in any other Chinese city for that matter. Someone teased me that, of course China would promote Christmas as much as anywhere else, since its economy stood to gain the most from it. On Christmas morning, I hummed right along with the speakers as I walked to campus to teach. The first class was one of my post-graduate classes. It wasn’t until my first students greeted me that there was any evidence that anyone even knew that this was the Christmas morning for which their manufacturers and shippers had been preparing. Practically every student went out of their way to give me their best wishes. Some greeted me with “Happy Christmas,” and I returned their kindness by telling them it was “Merry Christmas” and a “Happy New Year.” This batch was just so friendly and inquisitive that I didn’t mind working on Christmas Day. The fact that this was my smallest class with ages closer to mine made it more enjoyable. The blessing of having only twelve students was that we were able to arrange the seats for “round-table” discussions, in which I participated. I was quite pleasantly surprised when one of the students (a middle-school principal named Bruce) asked me to sing a Christmas song for them, and the others liked his suggestion. Bruce told everyone that he’d been hearing Christmas songs on the street speakers for a couple of weeks now, but they were in English and usually a little too fast for him understand. A couple of women in the classroom were excitedly shaking their heads in agreement like little girls, and another wanted me to tell them what were some of my favorite Christmas memories. “It is Christian?” probed Bruce. Silence fell upon everyone in that room with the force of a boulder. What happened next couldn’t have been talked about, because of the risk of being overheard by Communist ears. I never spoke about my manifestation to any others present, specifically, so that I could see if they also experienced it. I do not know if the change in the room’s ambience was felt by anyone else, or if it was simply a personal message from God to me, alone, assuring me that it would be alright to speak. If I was directing it in a movie, the white lighting would dim and then take on a solid blueish-gray tint. Next, everyone was motionless, except that they looked from one person to another—they seemed to be communicating in some kind of telepathic hi-tech, fiber-optic, laser-scan, inhuman sort of way. It wasn’t frightening to me, just astonishing—as if anyone can use the word “just” in describing such an occurrence! It may have lasted only five to fifteen seconds, but it felt more like a minute to me. Then it ended as suddenly as it started. Bruce rose from his chair and went and closed the classroom door, locked it, and returned to his seat without a saying a word, albeit that his motions had all been quasi-mechanical. Then, to my surprise, he began speaking to me with the tone of an instructor or authority figure, rather than that of an inquiring student. “Tell us about Jesus Christ,” he said. “That’s right,” I said. “And He was the son of God, who created the universe. God was sad that everyone on earth did bad things to Him and others. They disobeyed him like bad children. And God really does think of us, human beings, as being His children. His enemy, called Satan, you probably know him as ‘the Devil,’ would be able to kill them forever, as a result. But God had one Son, and He sent His one Son, Jesus, to come to Earth. After He grew up and preached several years, He was killed by the Romans. All of God’s people had been called Jews, but once Jesus Christ was killed, His believers were called ‘Christians.’ And by Him dying, all Christians are protected from being killed and tortured forever by Satan. As for Christmas and its traditions, some people say that we give each other gifts, because there were three kings from Asia who traveled to bring him gifts,” I added. What more could an unexperienced layman such as myself say to the class’s inquiry? So, I just looked around the group, until someone finally spoke. “Will you please direct me to a church? I want to learn more!” Sally’s exclamation made my mouth drop. Sally smiled like a child asking for candy, grinning big, and slightly thumping both of her arms on the desktop. No one said anything, but they appeared to be empathetic and equally curious (with several raised eyebrows) about what I would tell her. Every person in the room seemed to exhibit some level of disappointment, as if their favorite basketball team lost by a single shot. During the silence, two things came to my mind. First of all, I was confident that no one in the class would turn Sally—or me—in to the authorities and administrators for having this discussion in class. My second thought was that these students exemplified exactly what an acquaintance back in America had told me—the Chinese were hungry to learn something about Christianity. Without giving a second thought to my own risks, Sally’s courage prompted me to air my disappointment of the People’s Republic of China’s intolerance of free thinking and the hindrance of religious exploration that it exerted upon its citizens. Ironically, it seemed the harder the Communists fought to annihilate Christianity, the more it seemed to interest the Chinese, and consequentially, weaken their own dominance. I then told them that I was excited to be in China at that particular point in time, and that we very well may be watching, as history repeated itself. I said that it was possible that China was following in the footsteps of the Roman Empire—the Romans came to embrace the same Christianity it had once persecuted. A Chinese history teacher in my class firmly nodded at me, and from that gesture I got two messages—one, confirming my historical observation, and the other, that he “had not heard” me make such a statement, in the event anyone asked him about that morning’s discussion. For his solemnness, though, some in the circle chuckled in agreement, and others just smiled. An electronics teacher named Ricky was a graduate student in my last class of Christmas Day. The week before, after he’d been lingering alone in the middle of the classroom (while I was saying farewell to the students leaving the room), he came forward, once the last person left. “May I borrow a Bible, if you brought one to China?” he bravely asked me. Proven possession of a Bible is considered by the police to be contraband. People could be arrested and imprisoned (without a trial), where they would be tortured. When Ricky asked me to borrow my Bible—no one had uttered the slightest word about religion in class that day—I recalled the advice of my pastor back in America to use my time in China as an opportunity to be a missionary (and that didn’t mean that I had to preach to crowds). He had told me to just live my life as I thought Jesus would want me to, and it would be noticeable enough for people to come to me. Knowing how dangerous a person’s possession of a Bible could be, I cautiously told Ricky that I did indeed bring a Bible to China and that we’d “take care of things” after class that Christmas afternoon. He waited for me to turn out the classroom lights, and I told him where I lived and to come over in an hour, since I hadn’t wanted to cause trouble on campus. He was so excited that he arrived right on time, wearing a big smile. Although he accepted my invitation to step inside, he refused to take a seat or have a snack. There was nothing else to do except put the Bible in a shopping bag and bury it beneath some cheap crackers, fruit and produce, in case someone asked to inspect his bag. But that would be unlikely. I waited patiently while he stared down into the bag, to catch a glimpse of my gift. You would have thought he was Indiana Jones finding the Holy Grail! Eventually, he looked up at me, gave me a big thank-you, and he was as radiant as the first Christmas star must have been. Giving Ricky a Bible on Christmas might certainly have been the best Christmas gift I’ve ever given anyone. 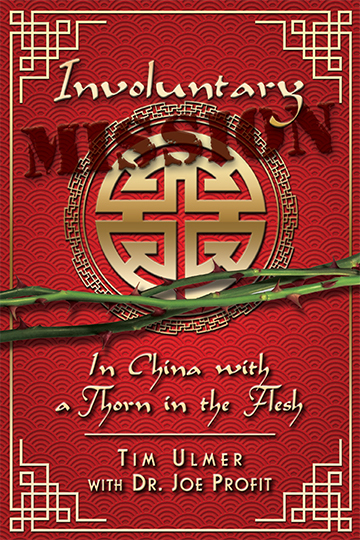 The story above is an excerpt from Tim Ulmer’s upcoming book, “Involuntary Mission: In China With a Thorn in the Flesh.” The book chronicles Tim’s experiences as an English teacher in a Chinese university and the hardships he faced from suffering from epilepsy and, at the same time, being forbidden to share or even talk about his Christian faith. His journey forces him to abandon the casualness of his Christian walk and to take a brave stand as layman missionary.